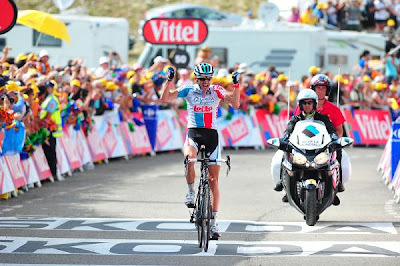 Jelle Vanendert (Omega Pharma-Lotto), now free to ride for stage victory since his team's GC leader Jurgen Van Den Broeck crashed out of the race in Stage 9, won the 168 km Saint-Gaudens - Plateau de Beille stage. It was his first victory as a professional. The GC leaders all marked each other on the Plateau de Beille. None of the attacks by Andy and Frank Schlek, and Ivan Basso, were successful. Cunego lost some time in the final kms. Voekler appeared incredibly strong and retains the yellow jersey. Lance Armstrong tweeted, "He was one of the strongest. The others weren't assertive and/or aggressive enough to make a selection. He has 2:06 on Evans. Final TT is 42km. He's French. It's the Tour de France. He won't lose 2:06 in the final time trial assuming he keeps them close on Alpe d'Huez. His teammate Pierre Rolland has been a rock star and has to continue to be. Lastly, the dude knows how to suffer. Will be fun to watch." Basso (Liquigas-Cannondale) and Cunego (Lampre - ISD) finished 11th and 12th, at 0:00:48 and 0:01:27. Japan, "Our Thoughts Are With You"
Milan is Back in the Saddle!